It "sounds" like what you are describing is a broken pex groment. Does it look like this kind of fitting set up? or at least the white groment in the middle of the pic? If so you can still buy either just the groment or buy a fitting and rob the groment out of it. These types of fittings use the groment. Many brands make them. I tried a hit on line on the Big box stores on line and it does not turn up but in the past I have bought them from Lowes. Try a good hardware store. Ace or others. 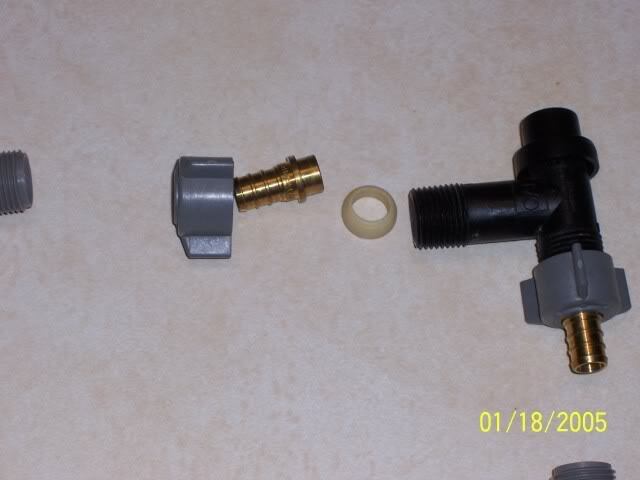 Thanks John..I just called an rv dealer (30mi away) and he has that fitting,also a coupler and extra pex if I need it since the line is short. He said cut the old one real close,measure for length,and hopefully I will only need the fitting...he does not have the little white thing separately for sale...doesnt have an old fiiting to rob one out of it. Thanks so much for the info and the pics. I tried to download the installation directions but the download didn't work--just wish I could get the stuff closer to my home! He quoted some prices--I will look online..again,thanks!! Janalee, glad you found a solution. Yes they now have Sharkbite brand fitting that can help do a splice with out the need of the expensive crimp tool. Other brands are now offer a similar setup. Do not know if you cut into this yet, if only your grommet is bad and the new fitting has the same grommet, rob that new grommet from the new fitting and use it on the old fitting. That said, PEX seems to have changed the shape of the grommet over the years and the new one may not work right with the old fitting. John..the grommet does not come out of the new ones..however,I cut the old fitting off the line,took it to Lowes plumbing dept. and got a 20" flexible water line to run from the faucet (my original pex line was very hard to connect being quite short so with the connector off I would need some new pex added with a coupler) to the remaining pex line via a new connector...now everything is quite accessible for me..I can keep an eye out for leaks. Thanks All for your help..I was able to go to Lowes with a better understanding of how it worked and what I needed..!! by the way, the compression fittings are great to use!